The 45th annual Baker Gordon Educational Symposium for aesthetic surgery will be taking place in Miami, FL from February 10-12, and aesthetic healthcare search engine marketing firm Rosemont Media will be there. Rosemont Media will be in attendance at the 45th Annual Baker Gordon Educational Symposium to be held in Miami, FL this February 10-12, 2011. 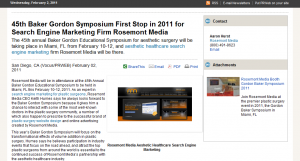 As an expert in search engine marketing for plastic surgeons, Rosemont Media CEO Keith Humes says he always looks forward to the Baker Gordon Symposium because it gives him a chance to interact with some of the most well-known doctors in the plastic surgery community, a number of which also happen to prescribe to the successful brand of plastic surgery website design and online advertising created by Rosemont Media. This year’s Baker Gordon Symposium will focus on the transformational effects of volume addition in plastic surgery. Humes says he believes participation in industry events that focus on the road ahead, and attract the top plastic surgeons from around the world is essential to the continued success of Rosemont Media’s partnership with the aesthetic healthcare industry. Rosemont Media will return home for spring break and the American Society of Cataract and Refractive Surgery (ASCRS) Symposium in San Diego from March 25-29, 2011, then hit the road again for the Aesthetic Meeting 2011 in Boston from May 6-10, which is sponsored by the American Society for Aesthetic Plastic Surgery (ASAPS). During the ASAPS event, Humes will continue his social media series designed specifically for the aesthetic healthcare industry, in addition to taking part in the practice management and marketing event on May 11, 2011. To bring the spring season to a close, the Rosemont Media team will attend the Annual Scientific Session of 2011 hosted by the American Academy of Cosmetic Dentistry (AACD) in Boston from May 18-21. Regardless of whether Rosemont Media is focusing on search engine marketing for plastic surgeons, website design and development, or dental and medical Facebook optimization, Humes says the modern ad agency is committed to exceeding client expectations, while developing and investing in the road ahead. Rosemont Media is the Modern Ad Agency. 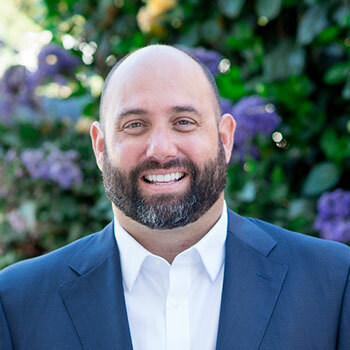 Led by 13-year search marketing guru, CEO Keith Humes, the firm operates at the nexus of innovative search engine marketing campaigns and custom website design for plastic surgeons, cosmetic dentists, bariatric surgeons, LASIK vision correction specialists and beyond. Rosemont Media works under the strictest terms of exclusivity to ensure optimum online performance and unparalleled brand identity for each practice. Rosemont Media is located at 1010 Turquoise St. Suite 201 in San Diego, CA 92109, and can be reached at (800) 491-8623. For more information about the custom medical and dental website design, search engine marketing consultancy, and online reputation management services Rosemont Media specializes in, visit www.rosemontmedia.com or the Rosemont Media Facebook page. To learn more about search engine marketing, medical and dental Facebook optimization, and how the latest internet and technology news affects the aesthetic healthcare industry, visit the Rosemont Review. The 45th Annual Baker Gordon Symposium will take place in Miami, FL from February 10-12, 2011. The premier plastic surgery event is jointly sponsored by the American Society for Aesthetic Plastic Surgery (ASAPS) and the University of Miami Leonard M. Miller School of Medicine. It is also endorsed by the American Society of Plastic Surgeons (ASPS) and the International Society of Aesthetic Plastic Surgery (ISAPS). This year’s Baker Gordon Symposium will focus on the emerging trends of plastic surgery, including the combination of surgical contouring and volume addition in procedures such as breast augmentation, facial rejuvenation, and much more. For more information on the 45th Annual Baker Gordon Symposium, visit bakergordonsymposium.com, or the Rosemont Media aesthetic healthcare search engine marketing blog, the Rosemont Review.